Richard Hainsworth is English from a Baha’i family. He was born in Uganda, Africa, to which his father had pioneered in 1951. In 1982, he and his wife Corinne moved to Moscow in the Soviet Union. 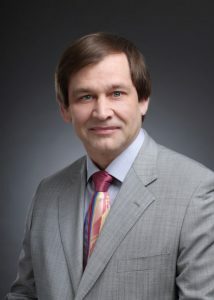 When the anti-religious laws were abolished in 1989, Richard served on the first LSA of Moscow in 1990, the first NSA of the Soviet Union in 1991, the Regional SA of Russia, Armenia and Georgia in 1992, and the first NSA of Russia in 1993. In 2000, Richard founded a bank credit rating agency in Russia, and became a leading authority on banks in Russia. He and his company were sued for US$20 million by a Russian bank for analyst comments following their down-grade by the rating agency. The case was won on appeal on the basis of freedom of speech in Russian law. An important part of assessing the credit-worthiness of any institution, whether it is a bank, a corporation or a government agency is understanding the way it is governed, and by whom it is governed. The principles that decision-makers use in their operations and the cultural environment in which the people forming the corporation work are fundamental to an understanding of the risk of the corporation, and its financial results reflect these ‘soft’ foundations. Culture is in turn affected by religious history. Corinne and Richard now reside in Hong Kong, are learning Cantonese, and have founded a small engineering design company to create robotic transport units for disabled people. They have three children, in Japan, England, and Italy, and three grandsons.